About: This is a history of the Quaker community which settled in the valley of the King’s River in West Wicklow. Also known as ‘The Religious Society of Friends’, The Quakers were heavily involved in the woollen and textile industry. Appendices to the main text include individual family details and a brief explanation of Quaker origins. This book was originally published as an eBook on the author’s website in 2015. 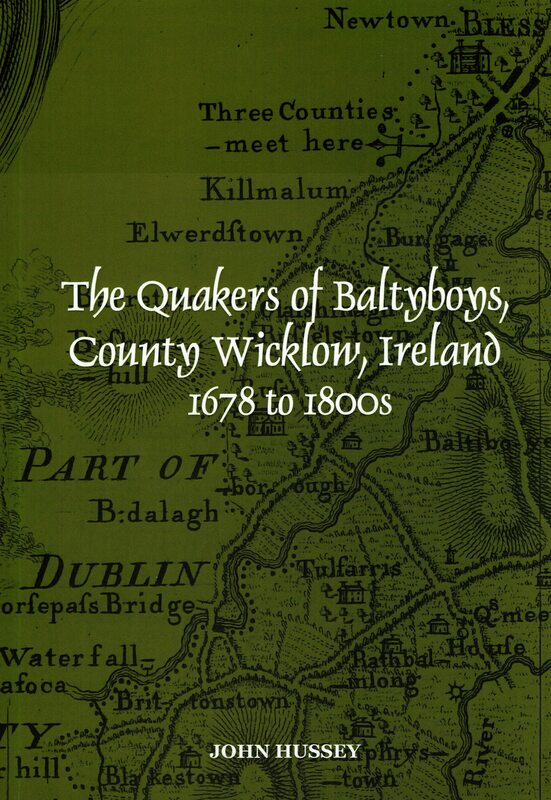 Contents: Preface – Acknowledgements – Foreword / Christopher Moriarty – Ballymore-Eustace, the gateway to West Wicklow — Baltyboys — The Quakers’ move to Ireland — The founding of Blessington ‘New Town’ – Visits by important Quakers to Dublin — Peter Peisley’s move to Baltyboys — The first Quaker lease at Baltyboys, 1678 — The role of the early Quakers at Baltyboys — The rationale for Quakers to settle at Baltyboys—Connections of the Baltyboys Quakers with Dublin — William Lappam’s refusal to pay tithes — Anthony Sharp’s visit to Blessington — Quaker settlement beyond Baltyboys — Other Protestant settlers of the early 1700s — Quaker weaving activities at Baltyboys – Disownments – Quaker Families at Baltyboys in 1791 — Peisleys replaced by Radcliﬀes – The 1798 Rebellion — Quaker Migration into the Church of Ireland — After the Quakers – Appendices: 1. The ‘Religious Society of Friends’ – 2.The Quaker meeting house and graveyard at Baltyboys – 3. Notes on individual Quaker families of Baltyboys – 4. Other family names. Extra #3: Includes two maps. Extra #4: Link to the Quakers in Ireland website. Extra #5: Link to the author’s website. About: This is a history of the Quaker community which settled in the valley of the King’s River in West Wicklow. Also known as ‘The Religious Society of Friends’, The Quakers were heavily involved in the woollen and textile industry. Appendices to the main text include individual family details and a brief explanation of Quaker origins. Extra #1: Browse to the full text of this ebook via this page at blessington.jimdo.com. Extra #2: Includes two maps.